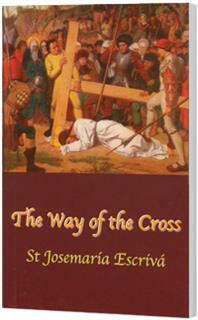 St. Josemaria Escriva provides meditations for each of the stations on the Way of the Cross. These meditations are especially suited to help find paths to holiness in the ordinary circumstances of everyday life. This pocket-size, sturdy booklet contains a beautiful, full-color illustration for each station. "The Way of the Cross is not a sad devotion. Msgr. Escriva taught many times that Christian joy has its roots in the shape of a cross. If the Passion of Christ is a way of pain, it is also a path of hope leading to certain victory. As he explained in one of his homilies: You should realise that God wants you to be glad and that, if you do all you can, you will never for a moment be without the Cross. But that Cross is no longer a gallows. It is the throne from which Christ reigns. And at his side, his Mother, our Mother too. The Blessed Virgin will obtain for you the strength that you need to walk decisively in the footsteps of her Son" (Friends of God).